Falkirk Council is to step in to maintain bus services that are being cut by operator First Scotland at the end of October. The authority's Policy and Resources committee has agreed to step in to replace the services while a review of non-commercial bus operations is undertaken. The review is expected to be completed by the end of January 2013. Six services in the Falkirk area will be taken over by the authority. 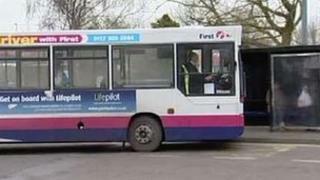 The council will continue to run the routes until the end of March 2013. The authority's leader, Craig Martin, said: "Many of these services serve outlying communities and therefore can be seen as very important to help sustain the local economy and allow local residents access to amenities elsewhere in the area. "The commercial decision by First to withdraw these services has left us in a very difficult situation and we see this as being the only way we can balance the needs of communities with the harsh realities of constrained budgets. "We need to take a closer look at these services provided but in the meantime, we can operate a substitute service that can support our communities." Falkirk Council also plan to maintain bus services from Callander Park and provide evening connections between Bo'ness and Linlithgow.